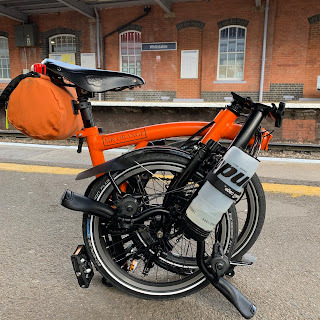 My Orange Brompton: Brompton Boys Badlands and Box Hill Bicycle bash! After spending a few hours at the zoo with Mrs Orange and the Orangettes I had a idea that a a ride from Kew Gardens to Box Hill and back later on might be a very good idea. With this in mind I fired off a group text message and waited for any takers. Thankfully Mark (King of the Hill) and David both replied that they were in. The agreed meeting time was 18:30 which meant I had a little time to get ready. Thinking that we might eat something at the legendary 'Smith & Western' I decided to eat a sandwich to tide me over. Heading off in the car to Kew Gardens I arrived with about 10 minutes to spare. Seeing that David had arrived I saddled up and went over to say hello and wait for Mark. He arrived a little while after and a little before 19:00 we set off - three years since we all did this very ride together. David set a brisk pace. The night was still, clear and starting to get a little colder but it certainly wasn't too chilly for the first half of the ride. Before long we arrived at Bushy Park and managed to enter the park just before the guard closed the gates at 19:00 sharp. Cycling through Bushy Park devoid of traffic was wonderful. We cycled three abreast, enjoying the freedom this brought. Passing Hampton Court we pressed on. The route was not followed by my Wahoo Bolt, an iPhone app or a Garmin device but simply from the memory of David. Much of the route I knew as well but there would be no way I could do this. David mentioned that we could cut a couple of miles off the route if we went through the Claygate badlands. The mere mention of this location induced the hairs on the back of my neck to do what they are meant to do when one hears something that brings out the primeval instincts to survive. Mulling it over Mark and I decided that we would have no problem with this. We approached the entrance to the Claygate Badlands. The tarmac of the road instantly changed into the rural and I really do mean rural. Muddy tyre tracks, footprints, the outline of horses hooves and probably a full range of farmyard animals - all filled with water - greeted us. I even started looking to see if there was a full moon! The complaining - from yours truly - started almost instantly and before I could do or say anything else David was enveloped by the night and gone. Mark followed and so did I. It was terrible. Traction was touch and go and at one point I peddled furiously and did not move an inch. Trying to traverse the treacle-like mud, ruts, tree roots, rocks, water and small mammals was terrifying. Eventually seeing stationary lights I knew the end had come and Mark and David waited. My poor Brompton was like a cyclocross bicycle. Mud was everywhere. When we rejoined the open road - hallelujah - the road was festooned with clods of mud, much the way a tractor does! We made out way to Box Hill and after a few climbs there were a few welcome descents. These felt very chilly and the night was turning a great deal colder than it had been at the start. Arriving at Box Hill we made our way up. David and Mark soon disappeared and I made my ascent at my own pace, knowing my legs were not capable of much more. At the top David was waiting. Mark had pressed on ahead to the 'Smith and Western' on recon. Upon seeing the 'Smith and Western' I again thought it strange that such a lively and vibrant place could be located at the top of Box Hill. The thought that Jane Austen - who mentioned Box Hill in 'Emma' - might faint at the sight and sound of such an establishment, filled me with a warm sense of glee. Thankfully we had good seats inside and with our Brompton bikes folded and sitting centimetres away. Ordering a burger called 'The Tennessee' we sat back and chewed the fat while we waited for our food to arrive. During this it transpired that David was an asthmatic. Not believing this fact David went to his backpack to produce his asthma pump! I speculated as to whether this would account for his immense speed! The food was wonderful and I was glad of it. As we ate our burgers as if ravenous, the song 'Always on my mind' was being played - naturally in a country and western style. It took me several minutes of contemplation to realise that the more famous version I was trying to think of but could not, was of course by Elvis Presley! People with a birthday had the staff in a procession banging a large triangle and then singing 'Happy Birthday. Others ate their food in a jail! I really do recommend a trip to this establishment as it is quite unique. With our food eaten we made our way outside and the temperature had decidedly dropped more than a few degrees. Following David the pace was brisk and at times I could hardly keep up. Thankfully traffic lights managed to create opportunities for me to do so. Approaching the Claygate Badlands I thought to myself that it could not be as bad as before. This is of course where I was proved to be wholly wrong! The Claygate Badlands seemed to want to have the last laugh. At times I didn't seem to move, such was the thick, molasses like mud. Several classic horror films started to play in my mind and I instantly thought of 'The American Werewolf in London!' Not wanting to have my throat ripped out by some creature of the night and become a tortured soul of the undead, I did the only thing I felt I could do which was peddle faster. Nearing the end of this horror ride, I lost all traction completely as I exited and felt my wheels hit tarmac once more. Telling David and Mark of my problem with the bike, David spotted that my chain had come free of the deraileur! Putting the chain back on normal service was resumed and we pressed on. As we started cycling the copious quantities of mud on our brake callipers, tyres and around our mudguards created a hissing sound, not that dissimilar to a steam train of days gone by. So it was that Thomas, Gordon and Henry puffed along on the the island of Sodor! Eventually we neared Twickenham where we said goodbye to David. Mark and I pressed on for Kew and just after midnight we had made it back - in one piece. Our Brompton bicycles - meant for the open road - are quite capable for almost anything you throw at them. Even a ride like this.